My one-year-old son insists on feeding himself. He has wanted to feed himself ever since he started eating solids. One slight problem with this show of independence - he for whatever reason likes to stick the pointy, non-spoon end in his mouth and chew on it. That is not a good move on his part. Gagging can result, and Mommy gets scared. The Play & Learn Baby Spoon designed by Baby Human prevents gagging, promotes self-feeding and is BPA, phthalate and lead free. It's a teaching tool, toy, teether and spoon all wrapped up in one package. Featuring dual spoon ends for right or left hand use and mouth guards on each end, the spoon is intended for babies just starting to learn eating skills. So far we've enjoyed testing the Play and Learn Baby spoons. My son grasps onto the chucky center grip easily. He attempts to pick up various foods off his tray and has succeeded in scooping up some mashed potatoes and yogurt. He likes chewing on the soft spoon ends. The spoon also works as a great distraction while I feed him with a different spoon. Because of the size of the mouth guard, the spoon does not fit down into small yogurt or baby food containers. Also, the bowl of the spoon is slightly flat, so it works best for self-feeding soft foods such as yogurt and applesauce rather than peas and other foods that could easily fall off. My final take on it: The spoon is a supplemental baby utensil that eliminates the worry of gagging, and is especially useful for babies just starting to eat solids and those learning to self-feed. According to the designer Kimberly Kirkup, the spoon is also appropriate for children with special needs. 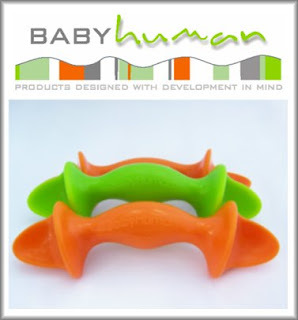 Each Play & Learn Baby Spoon package contains two stylish spoons (one orange and one green) and retails for $8.99. Thanks to Family Review Network and Baby Human for this review opportunity! These look so cool. I will have to try them out.